Mary Anne Dell’Aquila joined the Indianapolis Symphony Orchestra in 1986. Born in Kingsley, IA, she earned a Bachelor of Music degree from the University of Iowa where she studied with Allen Ohmes. Additional study was with Bernhard Goldschmidt of the Cleveland Orchestra and David Cerone at the Meadowmount School of Music. 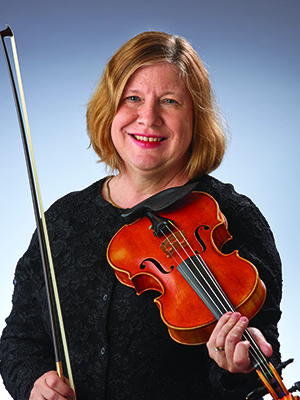 Before joining the ISO, Mary Anne was concertmaster of the Canton (OH) Symphony and played with North Carolina Symphony. Mary Anne has served as a section coach for the Orchestra’s Side by Side program and is involved with the ISO Learning Community. She is a former member of the New Century String Quartet and has served as a violin instructor at Interlochen. Mary Anne is married to a mathematician/physicist and enjoys dogs, reading and cooking.